Eager to find new sources of income beyond its popular online auction format, eBay Inc. launched a new service Thursday that encourages small- and medium-sized sellers to build Web stores that operate independent of the e-commerce powerhouse. EBay's new ProStores service will allow sellers to design their own fixed-price e-commerce site with a unique Web address. 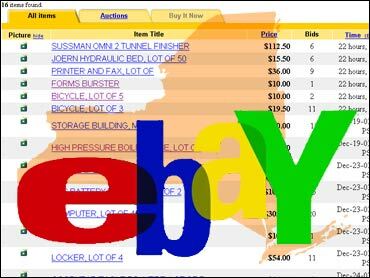 The service, which costs $6.95 per month with fees ranging from .5 percent to 1.5 percent of transactions, will allow users to link their custom-built site to their eBay site and use PayPal, eBay's popular online transaction service. The move comes as year-over-year revenue growth slows in the company's core auction format particularly in the United States and Germany, where eBay's market penetration is nearing saturation. The San Jose-based company has been aggressive about expanding into emerging markets such as China and India, but it also has experimented with online classified advertisements, real estate and other new business ventures to try to maintain double-digit revenue increases in the lucrative e-commerce markets of North America and western Europe. For several years, eBay employees have been charged with expanding the company beyond an online auction including creating services that transform eBay into a sort of consulting service for small business owners looking to build their e-commerce presence, said Michael Dearing, eBay senior vice president and general merchandise manager. About one in three of eBay's largest sellers people who sell entire lines of discontinued clothes from China and computer vendors who sell millions of dollars worth of cameras, servers and other equipment each month operate their own e-commerce stores. But more than 100,000 smaller sellers, who hawk everything from handmade sweaters to Pez dispensers, often don't have sites other than their eBay store, Dearing said. EBay's service is expected to be less expensive than traditional Web consultants, who often charge small businesses thousands of dollars to set up and maintain simple e-commerce sites. The new service also allows sellers to set up Web sites that can instantly take orders through PayPal, saving harried business owners from setting up secure accounts with a private bank, Visa and MasterCard, eBay executives said Thursday. "We are all about helping sellers succeed online, and we're building products and services to help them do that," Dearing said. "The marketplace will continue to be a foundation for a long time, but we know that sellers are interested in finding buyers all over the place and this can help them do that." The new service comes about a half-year after the San Jose-based company enraged many small-scale sellers with a hefty price hike that threatened to dent their profits. In mid-January, eBay warned sellers in a terse e-mail that the monthly subscription fee for people who operate "Basic eBay Stores" would increase from $9.95 to $15.95, and the fee for a standard listing of 10 days would double, from 20 cents to 40 cents. Also on Thursday, CEO Meg Whitman said the company, which ended 2004 with net income of $778.2 million and cash reserves of $1.33 billion, may offer a dividend or repurchase some shares. Like many Silicon Valley technology companies, 10-year-old eBay has never paid a cash dividend, preferring instead to reinvest profits on research and development, marketing promotions and other business expenses. "We aren't averse to returning cash to shareholders when we think we have a strategic reserve," Whitman said to about 100 shareholders who gathered in San Jose for an annual meeting. "But you have to be thoughtful of what you communicate when you do that." Whitman also brushed aside concerns of one shareholder, who worried about the company's sliding stock price. EBay shares have declined 40 percent from a 52-week high in December, trading at $35.63 Thursday on the Nasdaq Stock Exchange. "We're bullish about the long term for the company," said Whitman, an East Coast native who sported her trademark conservative black suit and sensible shoes. "Is the stock market efficient day to day, week to week? Probably not."